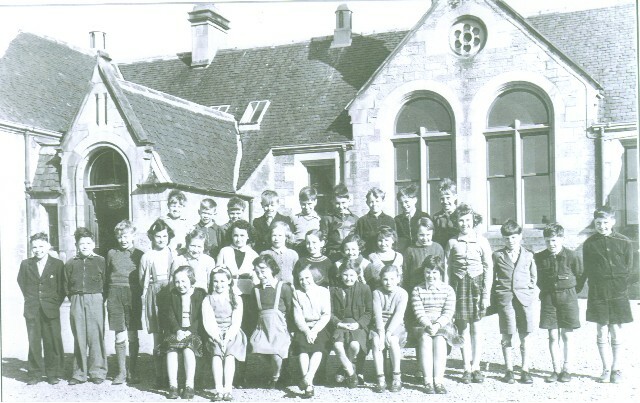 The Invergordon Archive - At Bottom School in the Mid-fifties-ish! At Bottom School in the Mid-fifties-ish! Back Row: Andrew Innes, Iain Murray, Bobby Hutton, Bobby Fair (supplied most of the names), David Russell, Mike Bell (now lives in Hereford), Jim Turner, Billy Harman. Middle Row: Drew Sinclair, Joe MacDonald (Me), Charles MacKay, Sally ?, Wilma Munro, Annie Mauchline, Doreen Ross, Muriel MacRae, Pamela MacKenzie, Doreen Douglas, Veronica Plaskett, Colin Ross, Roddy MacKenzie, Bobby MacIntosh. Front Row: Joan Ross, Elma Brown, Hilda Krefta, Jane Campbell, Kathleen ?, Jessie fraser, Jane Ross. "Kathleen ?" is Kathleen Ross who lived at what was then 4 Outram Street, next door to me. I understand she died from MS. Great picture Joe, I recall many of them in it. David Russell lived next to me at 2 Outram Street and Bobby Fair lived across the street in the prefab. There are 9 in the back row, you have named 8, who is the missing one? Harry, thanks for Kathleen's surname. I am not sure who I have missed out from the back row but it may be Keith Hermitage (3rd from right). I spoke to Mike Bell last year and had a couple of e-mails from Bobby Fair but apart from short sharp visits I have not really been back to Invergordon - I still have relatives there! Judging by your comments on other subjects I would surmise that you will be a little older than me - I am 64 next week. Anyway good to hear from you. Joe, from this photo I can see that we were not in the same class at school. I obviously remember you from when you visited Nora. I should have waited to see all of your photos before commenting!!!!! Hi Joe, do you remember me? I am down the front sitting next to Jane Ross, it being a long time no see. Front in the middle is Jane Fraser. Can you remember me - then I am Jessie Fraser? Re 'Jim' Turner in back row, was that not Ian Turner who lived in The Cottages? He had an older sister and younger sister June. I think the Ian Turner that you are referring to Ronald is a bit younger than this “vintage”. The one you mention appears in picture #820 in an Academy football team. Hi Graham. Almost certain it is the same Ian in both pictures because he was the same school year as my brother(Charles). In the football photo there is a about a 4 year age gap from eldest to youngest because our senior classes were relatively small. When I look at some of the other characters in the photo you are right. I thought that Ian Turner was similar age to the likes of George Strachan but he must have been slightly older. I stand corrected Ronald !!!! That's OK Graham. Ian T. was in a class one year senior to G.S. (and me! ).